In our project, we have faced interesting bug, I will describe it in this post. This bug is related to three elements - ADF Query Component, ADF Task Flow and Page Definition. Basically speaking, we have two pages in our application, when opening second page from first and closing it - first page wasn't rendered correctly. At first, we were thinking something wrong with our Close button in second page - however after investigation we didn't found anything wrong with it. After all, we did some crazy tests and found the reason of a problem we were facing. We have spent quite a lot of time in order to understood the reason for this problem. Finally, we have noticed, problem gone when Page Definition for a page contained in second ADF Task Flow was removed. That sounds really strange, but it works like this. 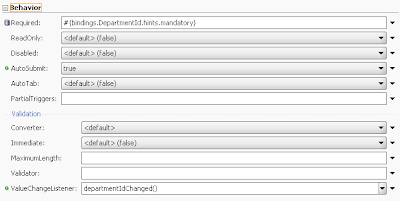 However, later I understood, main reason is ADF Query component. For some reason, this component is rendered in wrong way, when returning from ADF Task Flow with Data Control Scope set to Isolated. 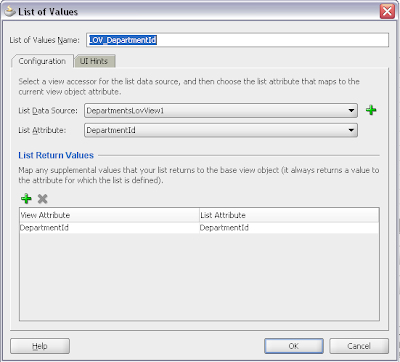 For second ADF Task Flow, set Data Control Scope to Shared. Yes, this works well. For some reason, when second ADF Task Flow is using same data control instance as a first one - ADF Query component is rendered correctly. It works even with Disclosed set to True. I personally, would like to recommend second approach, if you are not managing transactions. You can download sample application, where you can reproduce described bug - ADFBugTaskFlowQuery.zip. This error, is system error related to ADF Query criteria. When Data Control Scope for second ADF Task Flow is set to Shared, it works well. Titulo: Bugs en el uso combinado de ADF Task flow and ADF Query Component. Resumen: En este articulo, Andrejus muestra otro bug que tiene la herramienta, la cual se produce cuando se utiliza varios ADF Task Flow que muestra los mismos resultados basados en una consulta de datos. La solución finalmente radica en que ambos task flow compartan el mismo DataControl. I was very happy, when have noticed that Oracle have fixed null value bug in LOV component, I have described couple of weeks ago. This bug is fixed in newest JDeveloper 11g release - JDeveloper 11g Update 1. At first, this bug looks quite funny, however it was affecting lots of functionality related to LOV components. One of such examples is Cascading LOV functionality, previously it simply wasn't working, since it was impossible to assign null value to child LOV, if parent LOV value was changed. Now it works fine. Titulo: Listas de Valores en cascada en ADF 11. Resumen: Este capitulo muestra como construir listas de valores dependientes una de otra como el clásico (PAIS - DEPARTAMENTO). Andrejus destaca la solución de un bug que tenia esta funcionalidad pero que ha sido solucionada en la versión reciente de la herramienta. I was blogging previously about multiple LOV's per attribute functionality. 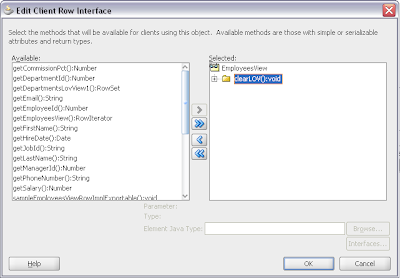 I was using RowImpl class for View object in order to calculate value for LOV switcher attribute. However, this approach is not perfect, since it requires to create Java implementation class with getter method. Even more, getter method in RowImpl class is not invoked, when LOV component is triggered in ADF Query Criteria component. I have described this cool component in my previous post - ADF Query Component and View Criteria Functionality with Custom Query Listener in 11g. So, as you probably already understood, I will show better approach for LOV switcher attribute implementation with Groovy language expression, defined as a Value for transient LOV switcher attribute. You can download developed sample application - ADFSearchApp2.zip. 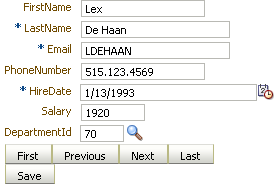 This sample as all my samples is based on standard HR schema available in Oracle XE. This application is based on previous sample. Only one addition here is LOV switcher attribute with Groovy expression, that allows to render different LOV components on runtime, based on data values. Same functionality works in results table, based on Salary value contained in current row. So, I would recommend you to use Groovy for multiple LOV's implementation instead of Java getter methods in RowImpl. Titulo: Uso del lenguaje Groovy para la creación de Lista de Valores en JDeveloper 11g. Resumen: Andrejus muestra como crear listas de valores en JDeveloper 11g haciendo uso del lenguaje Groovy. Recently I was deploying our ADF 11g application on standalone WebLogic server. Deployment itself is straightforward, however it is little bit more complex with security metadata migration from development environment to test environment. I have migrated application credentials and policy data using steps described in Steve Muench document - Simplified ADF 11g Application Credential and Policy Migration to Standalone WebLogic Servers. This document is very clear and useful, I would recommend to read and use for everyone who will face problem with security metadata migration to standalone WebLogic. 2) After you will succeed to migrate application credentials and policy to the test environment, this doesn't mean you will be able to run your application immediately (in a case of DD Only Security Model). Its because system-jazn-data.xml available on standalone WebLogic is populated with users and policies from development environment, however those users are not mirrored to standalone WebLogic. This means, authentication step will not be completed. In order to solve this issue, you can go to WebLogic console and in Security Realms (myrealm by default) you can define users you want to authenticate. There is no need to define roles for those users, since authorization will be done based on policies stored in system-jazn-data.xml available on standalone WebLogic after migration. Nice new component in ADF 11g is ADF Query - af:query. This component allows to implement Search functionality in your applications with much smaller effort comparing to Search functionality implementation in 10g. In conjunction with View Criteria, ADF Query provides declarative way for Query Criteria forms development. There is no need anymore to have transient attributes for Query Criteria, since we can base it on View Criteria attributes from View object. In this post I will describe how you can implement user-friendly Search functionality in 11g and how to use custom QueryListener for ADF Query. You can download developed application - ADFSearchApp.zip. This application provides sample page with ADF Query component and results table. Additionally, this application contains custom behavior - when there are pending changes in results table, re-query is not performed and user is forced to commit or rollback existing pending changes. Looks like in JDeveloper 11g, ADF Security works as it should work. In this post I will cover ADF Security part, related only to ADF Business Components. For example, Oracle Business Component Browser can be used now to test security configuration in Model layer. It wasn't working in 10g and in 11g Technology Preview builds, however in Production it works! This dialog was raised in previous JDeveloper builds as well, however authentication never was passed, it works now.